Norway is a beautiful place, well known for their salmon, vikings and their high costs of living. My friends and I brought 60 packets of instant noodles between the six of us on our holiday and I found out that my love for ramyeon (even if it’s Shin Ramyeon) can only take me so far. It wasn’t long before we headed out for the supermarkets and (I) started fawning over the fresh produce. While not cheap, it is cheaper than eating out and heaps healthier as well as more delicious than instant noodles. For the record, my favourite supermarket is KIWI cos of their low prices. Another cheap supermarket in Norway is EXTRA but I didn’t see it around all that much. The two other supermarkets I saw were COOP and JOKER. I kid you not. Haha! The numbers under joker state the opening hours of the supermarket. This one is open from 8am till 8pm. Heat the pan till it’s very very hot. This will brown the steak faster, allowing you to seal in the juices. Salt the steak or apply marinade before cooking but do not pepper it as pepper burns. This was my very very first attempt at cooking steak. Though the photo seems relatively well-lit, it was actually about 1am when we started eating. The first lesson I learnt when cooking steak, is that you should fry more than one slab at a time, especially if you are cooking for more than one person and there is space on the pan. The second lesson I learnt was that steaks don’t cook all that easily. While this one seems fine on the outside, because it’s sooo thick, it was extremely rare on the inside. I had to refry it. It must be a crime to come to Norway and not eat any salmon. We had smoked salmon (pictured), salmon sashimi and frozen salmon, which we popped into soup to cook. Steak attempt number 2 at Alesund. The meat was still very rare. 😦 Another slab of steak, cooked by Jia Hao, who also did the eggs, which were delightfully runny. Pardon the jus I should have sopped up in the picture below. 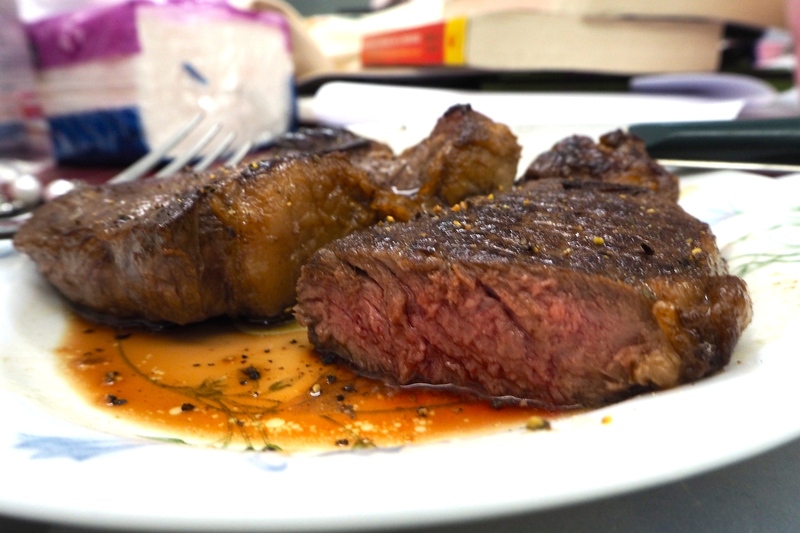 Having poked at 2 other pieces of steak, I had a better idea of how rare it was based on its texture while cooking. Still a wild guess but better than the first two times. I used a thinner slab of meat, which made it easier to cook AND sliced it into two. I think this is a better cut of meat, from the way it felt in my hands and the price. HAHA. I salted the meat with sea salt and patted it dry as the absence of water would allow the meat to brown faster. Sprinkled sea salt on meat and pat it dry. Placed butter on pan and waited for it to bubble. Pushed the meat back and forth to keep it cooking without burning. Cooked it for about 3-4 minutes in total.